Drilling The well is created by drilling a hole 5 to 50 inches (127.0 mm to 914.4 mm) in diameter into the earth with a drilling rig that rotates a drill string with a bit attached. After the hole is drilled, sections of steel pipe (casing), slightly smaller in diameter than the borehole, are placed in the hole. Cement may be placed between the outside of the casing and the borehole. The casing provides structural integrity to the newly drilled wellbore, in addition to isolating potentially dangerous high pressure zones from each other and from the surface. The drill bit, aided by the weight of thick walled pipes called "drill collars" above it, cuts into the rock. There are different types of drill bit; some cause the rock to disintegrate by compressive failure, while others shear slices off the rock as the bit turns. Drilling fluid, a.k.a. "mud", is pumped down the inside of the drill pipe and exits at the drill bit. Drilling mud is a complex mixture of fluids, solids and chemicals that must be carefully tailored to provide the correct physical and chemical characteristics required to safely drill the well. Particular functions of the drilling mud include cooling the bit, lifting rock cuttings to the surface, preventing destabilisation of the rock in the wellbore walls and overcoming the pressure of fluids inside the rock so that these fluids do not enter the wellbore. The generated rock "cuttings" are swept up by the drilling fluid as it circulates back to surface outside the drill pipe. The fluid then goes through "shakers" which strain the cuttings from the good fluid which is returned to the pit. Watching for abnormalities in the returning cuttings and monitoring pit volume or rate of returning fluid are imperative to catch "kicks" early. A "kick" is when the formation pressure at the depth of the bit is more than the hydrostatic head of the mud above, which if not controlled temporarily by closing the blowout preventers and ultimately by increasing the density of the drilling fluid would allow formation fluids and mud to come up through the annulus uncontrollably. The pipe or drill string to which the bit is attached is gradually lengthened as the well gets deeper by screwing in additional 30-foot (9 m) sections or "joints" of pipe under the kelly or topdrive at the surface. This process is called making a connection. Usually, joints are combined into three joints equaling one stand. 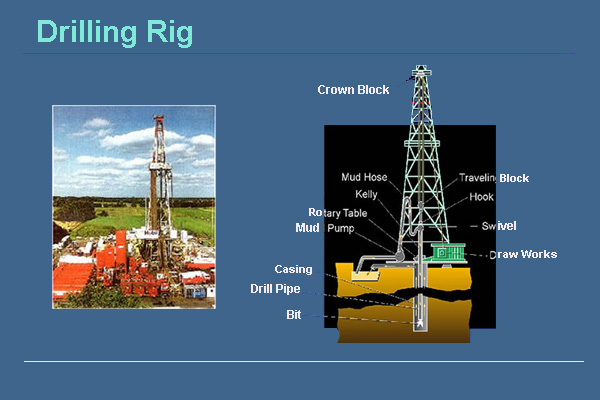 Some smaller rigs only use two joints and some rigs can handle stands of four joints. After drilling and casing the well, it must be 'completed'. Completion is the process in which the well is enabled to produce oil or gas. In a cased-hole completion, small holes called perforations are made in the portion of the casing which passed through the production zone, to provide a path for the oil to flow from the surrounding rock into the production tubing. In open hole completion, often 'sand screens' or a 'gravel pack' is installed in the last drilled, uncased reservoir section. These maintain structural integrity of the wellbore in the absence of casing, while still allowing flow from the reservoir into the wellbore. Screens also control the migration of formation sands into production tubulars and surface equipment, which can cause washouts and other problems, particularly from unconsolidated sand formations of offshore fields. Production The production stage is the most important stage of a well's life, when the oil and gas are produced. By this time, the oil rigs and workover rigs used to drill and complete the well have moved off the wellbore, and the top is usually outfitted with a collection of valves called a Christmas tree or Production trees. These valves regulate pressures, control flows, and allow access to the wellbore in case further completion work is needed. From the outlet valve of the production tree, the flow can be connected to a distribution network of pipelines and tanks to supply the product to refineries, natural gas compressor stations, or oil export terminals. Enhanced recovery methods such as water flooding, steam flooding, or CO2 flooding may be used to increase reservoir pressure and provide a "sweep" effect to push hydrocarbons out of the reservoir. Such methods require the use of injection wells (often chosen from old production wells in a carefully determined pattern), and are used when facing problems with reservoir pressure depletion, high oil viscosity, or can even be employed early in a field's life. In certain cases – depending on the reservoir's geomechanics – reservoir engineers may determine that ultimate recoverable oil may be increased by applying a waterflooding strategy early in the field's development rather than later. Such enhanced recovery techniques are often called "tertiary recovery". Abandonment A well is said to reach an "economic limit" when its most efficient production rate does not cover the operating expenses, including taxes. is an oil well's economic limit in oil barrels per month (bbls/month). is a gas well's economic limit in thousand standard cubic feet per month (MSCF/month). 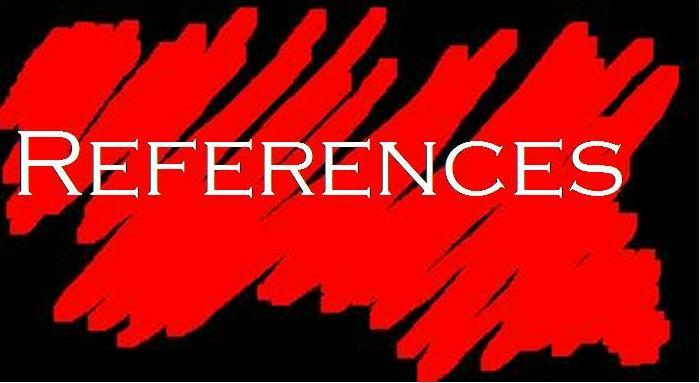 are the current prices of oil and gas in dollars per barrels and dollars per MSCF respectively. is the lease operating expenses in dollars per well per month. working interest, as a fraction. net revenue interest, as a fraction. condensate yield as barrel/million standard cubic feet. production and severance taxes, as a fraction. Fossil-fuel wells come in many varieties. By produced fluid, there can be wells that produce oil, wells that produce oil and natural gas, or wells that only produce natural gas. Natural gas is almost always a byproduct of producing oil, since the small, light gas carbon chains come out of solution as they undergo pressure reduction from the reservoir to the surface, similar to uncapping a bottle of soda pop where the carbon dioxide effervesces. Unwanted natural gas can be a disposal problem at the well site. If there is not a market for natural gas near the wellhead it is virtually valueless since it must be piped to the end user. Until recently, such unwanted gas was burned off at the wellsite, but due to environmental concerns this practice is becoming less common. Often, unwanted (or 'stranded' gas without a market) gas is pumped back into the reservoir with an 'injection' well for disposal or repressurizing the producing formation. Another solution is to export the natural gas as a liquid. Gas-to-liquid, (GTL) is a developing technology that converts stranded natural gas into synthetic gasoline, diesel or jet fuel through the Fischer-Tropsch process developed in World War II Germany. Such fuels can be transported through conventional pipelines and tankers to users. Proponents claim GTL fuels burn cleaner than comparable petroleum fuels. Most major international oil companies are in advanced development stages of GTL production, e.g. the 140,000 bbl/d (22,000 m3/d) Pearl GTL plant in Qatar, scheduled to come online in 2011. In locations such as the United States with a high natural gas demand, pipelines are constructed to take the gas from the wellsite to the end consumer. exploration wells are drilled purely for exploratory (information gathering) purposes in a new area. appraisal wells are used to assess characteristics (such as flow rate) of a proven hydrocarbon accumulation. production wells are drilled primarily for producing oil or gas, once the producing structure and characteristics are determined. water injectors injecting water into the formation to maintain reservoir pressure, or simply to dispose of water produced with the hydrocarbons because even after treatment, it would be too oily and too saline to be considered clean for dumping overboard offshore, let alone into a fresh water resource in the case of onshore wells. Water injection into the producing zone frequently has an element of reservoir management; however, often produced water disposal is into shallower zones safely beneath any fresh water zones. aquifer producers intentionally producing water for re-injection to manage pressure. If possible this water will come from the reservoir itself. Using aquifer produced water rather than water from other sources is to preclude chemical incompatibility that might lead to reservoir-plugging precipitates. These wells will generally needed only if produced water from the oil or gas producers is insufficient for reservoir management purposes. Cost The cost of a well depends mainly on the daily rate of the drilling rig, the extra services required to drill the well, the duration of the well program (including downtime and weather time), and the remoteness of the location (logistic supply costs). The total cost of an oil well mentioned does not include the costs associated with the risk of explosion and leakage of oil. Those costs include the cost of protecting against such disasters, the cost of the cleanup effort, and the hard-to-calculate cost of damage to the company's image. Offshore platforms (the structure supporting the wells) often provide habitat for marine life. After the wells have been abandoned, sometimes the platforms can be toppled in place or dropped to the ocean floor elsewhere to produce artificial reefs. 2. ^ a b Joseph P. Riva Jr. and Gordon I. Atwater. "petroleum". Encyclopædia Britannica. Retrieved 2008-06-30. 3. ^ Dr. Kasem Ajram (1992). The Miracle of Islam Science (2nd Edition ed.). Knowledge House Publishers. ISBN 0-911119-43-4. 5. ^ a b Mohammed A. Mian, Petroleum Engineering Handbook for the Practicing Engineer, Tulsa, Okla.: PennWell, 1992, p.447. 6. ^ Oilfield Glossary - "working interest"
by Craig C. Freudenrich, Ph.D.
Oil is a fossil fuel that can be found in many countries around the world. 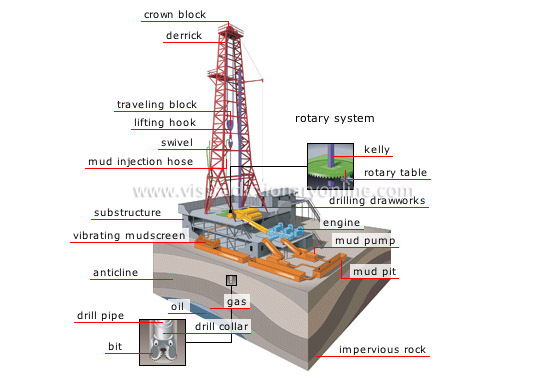 In this section, we will discuss how oil is formed and how geologists find it. Oil is formed from the remains of tiny plants and animals (plankton) that died in ancient seas between 10 million and 600 million years ago. After the organisms died, they sank into the sand and mud at the bottom of the sea. Oil forms from dead organisms in ancient seas. Over the years, the organisms decayed in the sedimentary layers. In these layers, there was little or no oxygen present. So microorganisms broke the remains into carbon-rich compounds that formed organic layers. The organic material mixed with the sediments, forming fine-grained shale, or source rock. As new sedimentary layers were deposited, they exerted intense pressure and heat on the source rock. The heat and pressure distilled the organic material into crude oil and natural gas. The oil flowed from the source rock and accumulated in thicker, more porous limestone or sandstone, called reservoir rock. Movements in the Earth trapped the oil and natural gas in the reservoir rocks between layers of impermeable rock, or cap rock, such as granite or marble. Oil reservoir rocks (red) and natural gas (blue) can be trapped by folding (left), faulting (middle) or pinching out (right). Folding - Horizontal movements press inward and move the rock layers upward into a fold or anticline. Faulting - The layers of rock crack, and one side shifts upward or downward. Pinching out - A layer of impermeable rock is squeezed upward into the reservoir rock. The task of finding oil is assigned to geologists, whether employed directly by an oil company or under contract from a private firm. Their task is to find the right conditions for an oil trap -- the right source rock, reservoir rock and entrapment. Many years ago, geologists interpreted surface features, surface rock and soil types, and perhaps some small core samples obtained by shallow drilling. Modern oil geologists also examine surface rocks and terrain, with the additional help of satellite images. However, they also use a variety of other methods to find oil. They can use sensitive gravity meters to measure tiny changes in the Earth's gravitational field that could indicate flowing oil, as well as sensitive magnetometers to measure tiny changes in the Earth's magnetic field caused by flowing oil. They can detect the smell of hydrocarbons using sensitive electronic noses called sniffers. Finally, and most commonly, they use seismology, creating shock waves that pass through hidden rock layers and interpreting the waves that are reflected back to the surface. The shock waves travel beneath the surface of the Earth and are reflected back by the various rock layers. The reflections travel at different speeds depending upon the type or density of rock layers through which they must pass. The reflections of the shock waves are detected by sensitive microphones or vibration detectors -- hydrophones over water, seismometers over land. The readings are interpreted by seismologists for signs of oil and gas traps. Although modern oil-exploration methods are better than previous ones, they still may have only a 10-percent success rate for finding new oil fields. Once a prospective oil strike is found, the location is marked by GPS coordinates on land or by marker buoys on water. Once the site has been selected, it must be surveyed to determine its boundaries, and environmental impact studies may be done. Lease agreements, titles and right-of way accesses for the land must be obtained and evaluated legally. For off-shore sites, legal jurisdiction must be determined. The land is cleared and leveled, and access roads may be built. Because water is used in drilling, there must be a source of water nearby. If there is no natural source, they drill a water well. They dig a reserve pit, which is used to dispose of rock cuttings and drilling mud during the drilling process, and line it with plastic to protect the environment. If the site is an ecologically sensitive area, such as a marsh or wilderness, then the cuttings and mud must be disposed offsite -- trucked away instead of placed in a pit. Once the land has been prepared, several holes must be dug to make way for the rig and the main hole. A rectangular pit, called a cellar, is dug around the location of the actual drilling hole. The cellar provides a work space around the hole, for the workers and drilling accessories. The crew then begins drilling the main hole, often with a small drill truck rather than the main rig. The first part of the hole is larger and shallower than the main portion, and is lined with a large-diameter conductor pipe. Additional holes are dug off to the side to temporarily store equipment -- when these holes are finished, the rig equipment can be brought in and set up. Place the drill bit, collar and drill pipe in the hole. Attach the kelly and turntable and begin drilling. As drilling progresses, circulate mud through the pipe and out of the bit to float the rock cuttings out of the hole. Add new sections (joints) of drill pipes as the hole gets deeper. Remove (trip out) the drill pipe, collar and bit when the pre-set depth (anywhere from a few hundred to a couple-thousand feet) is reached. Once they reach the pre-set depth, they must run and cement the casing -- place casing-pipe sections into the hole to prevent it from collapsing in on itself. The casing pipe has spacers around the outside to keep it centered in the hole. The casing crew puts the casing pipe in the hole. The cement crew pumps cement down the casing pipe using a bottom plug, a cement slurry, a top plug and drill mud. The pressure from the drill mud causes the cement slurry to move through the casing and fill the space between the outside of the casing and the hole. Finally, the cement is allowed to harden and then tested for such properties as hardness, alignment and a proper seal. The U.S. Department of Energy and the oil industry are working on new ways to drill oil, including horizontal drilling techniques, to reach oil under ecologically-sensitive areas, and using lasers to drill oil wells. In the movies, you see oil gushing (a blowout), and perhaps even a fire, when drillers reach the final depth. These are actually dangerous conditions, and are (hopefully) prevented by the blowout preventer and the pressure of the drilling mud. In most wells, the oil flow must be started by acidizing or fracturing the well. Once they have reached the final depth, the crew completes the well to allow oil to flow into the casing in a controlled manner. First, they lower a perforating gun into the well to the production depth. The gun has explosive charges to create holes in the casing through which oil can flow. After the casing has been perforated, they run a small-diameter pipe (tubing) into the hole as a conduit for oil and gas to flow up the well. A device called a packer is run down the outside of the tubing. When the packer is set at the production level, it is expanded to form a seal around the outside of the tubing. Finally, they connect a multi-valved structure called a Christmas tree to the top of the tubing and cement it to the top of the casing. The Christmas tree allows them to control the flow of oil from the well. 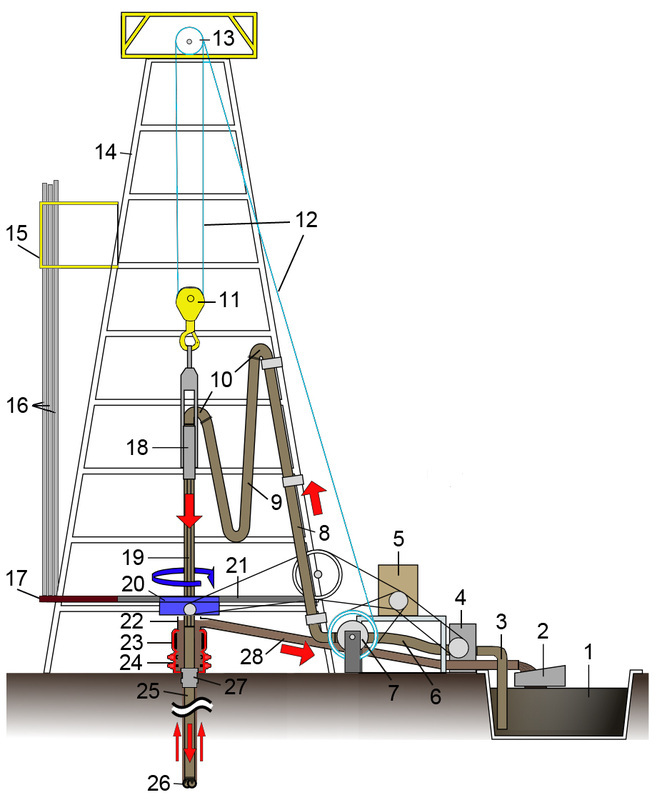 Once the well is completed, they must start the flow of oil into the well. For limestone reservoir rock, acid is pumped down the well and out the perforations. The acid dissolves channels in the limestone that lead oil into the well. For sandstone reservoir rock, a specially blended fluid containing proppants (sand, walnut shells, aluminum pellets) is pumped down the well and out the perforations. The pressure from this fluid makes small fractures in the sandstone that allow oil to flow into the well, while the proppants hold these fractures open. Once the oil is flowing, the oil rig is removed from the site and production equipment is set up to extract the oil from the well. After the rig is removed, a pump is placed on the well head. In the pump system, an electric motor drives a gear box that moves a lever. The lever pushes and pulls a polishing rod up and down. The polishing rod is attached to a sucker rod, which is attached to a pump. This system forces the pump up and down, creating a suction that draws oil up through the well. In some cases, the oil may be too heavy to flow. A second hole is then drilled into the reservoir and steam is injected under pressure. The heat from the steam thins the oil in the reservoir, and the pressure helps push it up the well. This process is called enhanced oil recovery. With all of this oil-drilling technology in use, and new methods in development, the question remains: Will we have enough oil to meet our needs? Current estimates suggest that we have enough oil for about 63 to 95 years to come, based on current and future finds and present demands.